Our Tamera E3 Light Crème was featured in the April issue of Allure Magazine! War Wounds, Tiger Stripes, The Map to Motherhood, all adorably poetic terms for something, well, not so terribly adorable… Stretch Marks. And even if they are my guidemap throughout pregnancy, well, I’d rather use Google Maps, thank you very much. 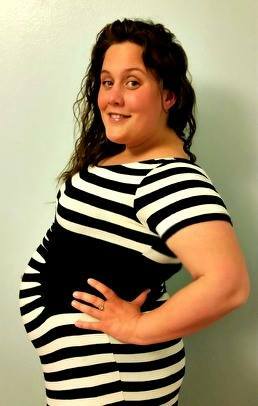 Since the beginning of my pregnancy, I’ve had a slight paranoia, as do many women, about ending my pregnancy with a paisley striped pattern of stretch marks etched across my body. Even if this was my ‘secret handshake’ into the mom’s group, I planned on doing whatever possible to ensure that not one tiger stripe touched my skin. But what can you do to avoid stretchmarks? Of course, there is no surefire method to absolutely eliminate stretch marks throughout pregnancy. As any woman will tell you, pregnancy will completely change your body in ways you didn’t think previously possible. That being said, it is possible to reduce the amount or intensity of stretchmarks throughout your pregnancy; and in the end, isn’t that what we all want? Of course, staying hydrated is incredibly important for the health and well-being of mama and baby. Experts suggest that a person should be drinking half of their body weight in ounces of pure, filtered water each day! As important as it is, that doesn’t mean that drinking enough water is always easy (especially when you already have to use the restroom every few minutes!). I found that naturally flavoring water with fruits and herbs was a wonderful way to keep water interesting and ensure that I get my required daily amount. I especially loved adding Strawberry and Mango to my water for a sweet treat! Certain vitamins and nutrients can be especially helpful in reducing or avoiding stretch marks. Antioxidants, Vitamin E, Vitamin A, and Omega 3s are fantastic supplements to add to your diet that may help reduce stretch marks. And while you can absolutely take those in capsule form, it is even better for your body to include them in your diet! Foods such as leafy greens, fruits, veggies, nuts, seeds, and healthy oils will naturally nourish and protect the skin and can even repair skin cell damage. While it does sound nice to lay around for nine months, it is very beneficial for pregnancy and delivery if you stay active. Of course, your activity levels should be based entirely on what is suggested by your doctor, but low-impact exercises such as yoga, swimming, and pilates are wonderful ways to remain flexible, fit, and help blood to circulate through the body. Beyond that, exercise can help maintain skin elasticity and weight gain, which can help to prevent stretch marks. I personally love swimming during pregnancy as I can actually feel the pressure being relieved from my joints and lower back when I’m in the water. No matter what we do to nourish the inside of our bodies, our skin is fighting external forces constantly. Pollutants, weather, sensitivity, and allergens can affect the health of our skin and can lead to damage. Moisturizing the skin daily with natural oils can effectively alleviate or diminish stretch marks due to the fatty acids and rejuvenating minerals they contain. Some suggested oils for hydrating the skin are coconut, grape seed, emu, and cocoa butter with Vitamin E. When purchasing any of these, ensure that you are doing so from a quality source and that they are free from all preservatives, additives, and are 100% pure. And so it was, one day, at about 34 weeks pregnant, that I stood in front of the mirror doing my daily routine. Lathering my tummy and back with E3 Earth’s Essential Creme when I saw it, the faint outline of a stretch mark across my belly. I paused and pondered the little line that stretched across my side, stared at it in curiosity… I expected myself to cry out in agony and curse the skies above, maybe even cry. Instead, and unexpectedly so, I shrugged and continued on with my day. Hm, I guess stretch marks really aren’t that big of a deal after all. Kali Carter, a mama-to-be, loves getting lost in big books and even bigger cities.